So You Think You Want to Go 4K? After upgrading most of the components in my PC earlier this year, I convinced myself that my 5-year-old display was keeping me from enjoying my time spent at the computer to the fullest. I first began using an LCD TV in 2011 when I replaced a Dell U2711 monitor that I hated gaming on with a 40-inch Samsung. The Samsung began to fail around a week after its warranty expired and I replaced it with a bargain bin VA panel TCL HDTV. Using a 1080p panel of that size was not ideal for many types of computing tasks, but it shined when it came to displaying games and the extra size really helped immersion. I researched high-speed 27-inch gaming monitors and the extremely expensive ultrawides, but I ended up in familiar territory. Near the end of July 2017 I began the journey into 4K with the purchase of the TCL 43S405. The 43S405 was featured in a guide I wrote about affordable 4K TVs for desktop usage back in July. In the 5 years since I acquired my older TCL set, LCD TVs experienced advancements in line with any other high-tech device. Panel manufacturers continued to evolve and improve production to the point where budget-class sets could rival or beat the performance of flagship offerings from years past. After moving on from the 3DTV fad, TV manufacturers pushed hard towards increasing the industry standard resolution to 4K (3820x2160), providing a sharp picture that featured four times as many pixels as common 1080p displays. 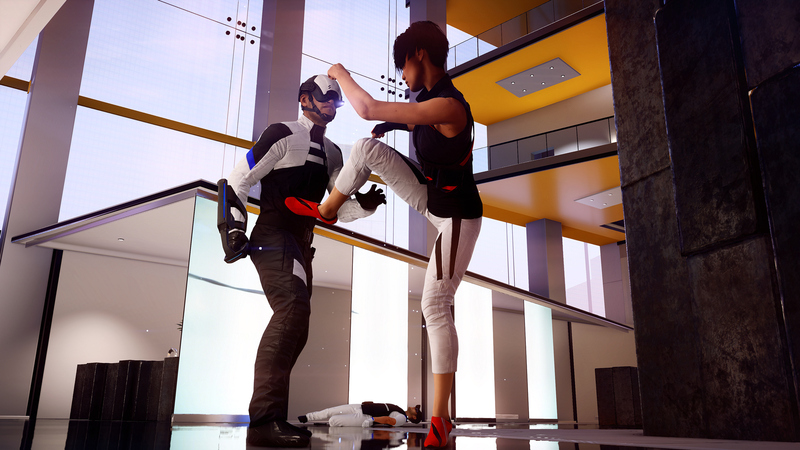 The sharp textures and excellent lightning of Mirror's Edge 2 produces a lifelike image when rendered in 4K. Along with the race to expand 4K adoption, LCD manufacturers began offering panels capable of displaying wider color gamuts and shining much brighter than previous offerings. This feature is known as high dynamic range, or HDR for short. HDR-capable displays produce bright, high-contrast images with incredibly vibrant colors. PC gamers may be familiar with a simulation of this effect in games. It first debuted in October of 2005 with the Half-Life 2: Lost Coast level. The setting attempts to mimic the extreme contrast between brightly lit areas and darker scenes in the shadows by artificially blowing out the brightness of the display to mimic the effect our eyes experience when leaving a dark room to walk outside into the bright sun. The simulated video game effect offered no enhancement to colors as virtually all displays were incapable of reproducing the additional colors. The wide color gamuts provided by the new generation of HDTVs offers color reproduction previously available in only the most expensive professional-grade monitors. Typical gaming monitors (and most conventional PC displays) offer a much more limited color space and traditional levels of brightness. HDR-capable monitors will have widespread availability in the coming years (LG’s 32UD99-W and Samsung’s C32HG70 are the only available HDR monitors at the time of writing). As of right now, HDTVs are the only way to experience this next big advancement in display technology for an affordable price. Why Not a Gaming Monitor? Coming back to the TCL 43S405, I settled on the panel for the reasons outlined in the 4K TV PC display guide and because Target was offering to ship it to me for free at an unbeatable price of $279. At this price point, my options with a 27-inch 1440p display were limited to a few basic 60Hz models. Anything with a high refresh rate or adaptive sync would cost me at least $120 more and still leave me short of the 4K resolution and HDR output offered by the TCL. 27-inch G-Sync capable monitors or the popular ultrawides would be in the neighborhood of $800 more, unless I went with a poor contrast, color-banding TN panel. None of the displays I compared it to could match the eye-popping contrast or color reproduction. That’s not to say I wasn’t making a compromise with the TCL, as there are no perfect displays. The VA panel in the TCL offers a limited viewing angle when matched against a nice IPS display, making a poor choice for use as a side monitor or for any viewing that is off-center. If you get your head very close to the screen, you can notice a subtle color degradation on the extreme corners. The display’s 60Hz refresh rate is less than ideal compared to the high-speed 27 and 34-inch offerings, but current limitations in cable standards prevent the use of any refresh rate over 60Hz at 4K anyway. 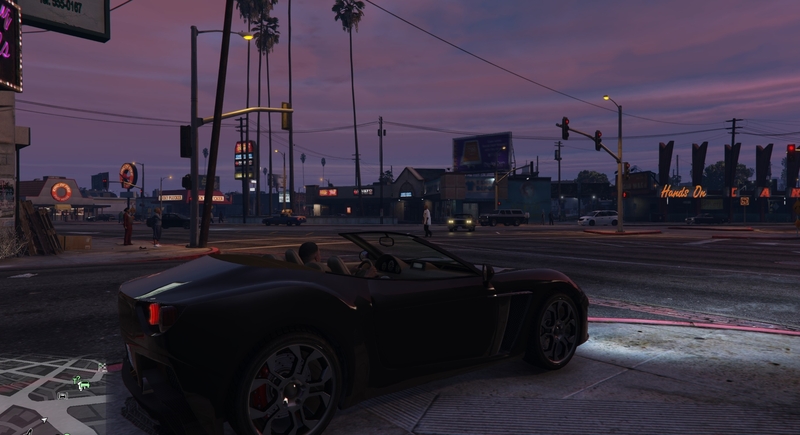 GTA V's cityscape becomes hypnotic when the heavy aliasing on utility poles and power lines is removed at 4K. Unboxing and setting up the 43S405 was a breeze. I quickly attached some wall mount brackets to the rear VESA holes and had the panel flush-mounted to the wall above my desk less than 10 minutes after it was pulled out of the box. I used a new HDMI 2.0b-certified cable to connect the display to my video card. This particular screen uses a built-in Roku-based firmware and menu system. I was able to login to my existing Roku account and it downloaded all my apps automatically. I entered the setup menu and made sure to select HDMI 2.0 for the applicable port I was using instead of the default HDMI 1.4. HDMI 1.4 is limited to 30Hz refresh rate at 4K, does not support 4:4:4 chroma subsampling for text readability, and will not support the wider color gamut needed for HDR. I got booted into Windows and the PC auto-adjusted itself to the native 4K resolution. Using the nVidia Control Panel was required to set the output color to 10-bit with full dynamic range. I tapped Win+D on my keyboard to minimize all windows and take a survey of my desktop wallpaper and icons. I was not expecting such a crisp, vibrant picture. Admittedly, I was coming off of using a 1080p panel at 75% DPI scaling for years, so just about anything would be an improvement, but to call the results produced by a 4K display impressive is an understatement. I snapped 4 different windows into the corners of the display and each one was like a perfect 22-inch monitor of its own, without the hassle of the bezels you get with a multi-monitor array. I hopped onto Youtube and began watching 4K/60fps videos and the grin on my face grew wider. Sadly, HDR is not currently supported by Youtube on the desktop yet. I was able to view HDR-enabled Youtube videos using the Youtube app with the built-in Roku software on the TV, though, along with HDR Netflix, Amazon Video, and Vudu. I pointed my browser at a few monitor testing and calibration website to check for problems and as a guide for making sure my brightness, contrast, and color settings were up to snuff. The TCL display offered all the standard options, but most of the advanced gamma and white balance controls were only accessible via the Roku smartphone app. At first, I saw this as an inconvenience, but after using it to manipulate white balance values, I can safely say that using a touchscreen is so much more effective than a standard remote and conventional TV menus. Simply inputting the number values I needed was much easier than hitting left or right on a remote 700 times. Hellblade: Senua's Sacrifice is one of the best looking games of 2017. The 4K presentation is nothing short of stunning. By this point, I was ready to hop into games. Rocket League was the first test and while it has always looked pretty good, it is a treat when playing at 4K. Seeing the raindrops cause refractions in the water puddles on NeoTokyo and noticing the individual reflections of light in the metallic paint spray on my rocket car while moving at full speed was not something I imagined was possible. All the shimmering effect seen on distant walls and on the bubble people in the stands was eliminated, giving the game the look of a pre-rendered CGI movie. Despite using the older GTX 970, I was able to maintain a locked 60fps at maximum settings, though Rocket League has never been a particularly demanding title on GPUs. It only took about 12 seconds of playing PUBG at 4K to realize that my older card would not be effective with any demanding titles at such a high resolution. I tried everything I had installed on my Steam account to get an idea of how each game performed at 4K and which settings needed to be compromised to reach a stable 60fps. Some very well optimized titles like Doom could run at high settings with a locked 30fps at 4K, but that was a less than ideal solution. Enter the magic of scaling. Sony’s PS4 Pro and Microsoft’s upcoming Xbox One X tout the ability to experience your console games at 4K resolution, but with hardware that often pales in comparison to most gaming PCs, the number of games that render on those consoles at full resolution is extremely limited. The solution was to render the more complex or graphically intensive games at lower resolutions and then upscale the result and output to TVs at 4K. While this method does not offer the same crisp look of a native 4K render, it gets really close. Uncharted 4, one of Sony’s flagship 4K titles, is actually rendered at 1440p and upscaled before hitting the display. When things get hectic on screen while playing, the difference can often be unnoticeable. While most TVs and monitors have a built-in display scaler, they are usually underpowered and can produce less than ideal results. When upscaling from a PC with a nice graphics card, PC gamers can take advantage of the beefy hardware provided by their GPU. In my case, the nVidia control panel offers the option to scale non-native resolutions with the monitor or GPU. I selected the GPU option and used a program called Custom Resolution Utility to create some 16x9 resolutions that would be easier on my GPU than 4K and offer high-quality results when combined with the upscaler on my GTX 970. I added 3584x2016, 3200x1800, and 2944x1656 using the CRU utility. These resolutions were now selectable for display on the Windows desktop and all my games. The GPU scaling I enable ensures that all images being sent to my display are native 1:1 pixel 4K (3840x2160). While Doom had previously been choppy at full 4K, I could now play the game at the highest settings with 8x TXAA with a locked 60fps using the 2944x1656 resolution and the results were fantastic. It looked so much better than the 1080p experience I was used to and ran butter smooth. Batman: Arkham Knight could reliably hit 60fps using upscaling if I used medium settings and disabled the nVidia Gameworks options. The Gotham skyline was breathtaking now that all the aliasing and shimmer from distant buildings and light was gone. Individual raindrops could easily be seen and the increase in resolution allowed for better colors since there were now 4 pixels providing color where 1 had previously been.Some games were still unable to hit 60fps with scaling and lowered settings. My 3 year old graphics card was simply not designed for this, even though it put up a strong battle and would be more than adequate for lighter gaming and day to day 4K desktop usage. 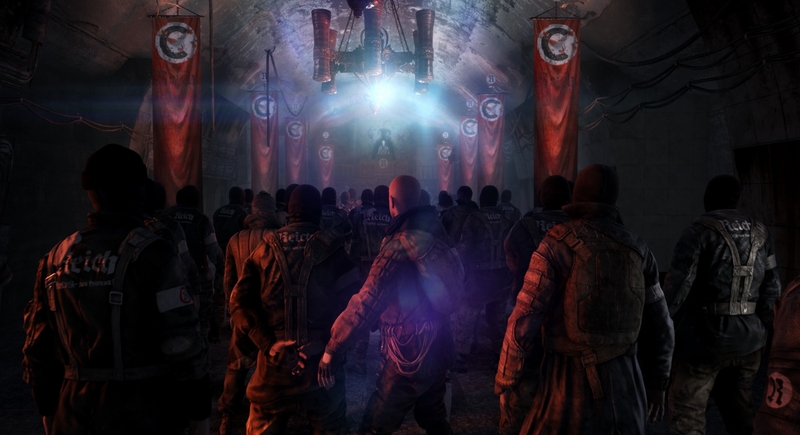 The dark sewers and interiors of Metro: Last Light shine in 4K. Character models and clothing textures look incredible. As a PC gamer, there is nothing like the feeling you get when you buy a new graphics card. In this case, the nVidia GeForce GTX 1080 Ti was chosen to push my 4K performance into the stratosphere. The card is so fast that it makes a horrible value for PC gamers at 1080p because modern CPUs are often incapable of delivering instructions to it in a timely manner. At 1440p and above, the card can stretch its legs and do what it does best. Virtually all of the games that required upscaling and lowered settings were now running at native 4K on ultra. It is hard to describe my reaction to seeing The Witcher 3 at 4K60fps. It looked like a hyper-detailed painting come to life. I hopped onto Roach and simply galloped across the countryside for almost an hour. Because PUBG is pretty much the Trespasser of 2017, running the game at a stable 60fps using ultra settings at 4K is not possible, even on hardware as capable as the GTX 1080 Ti. Thankfully, the lessons learned trying to make the GTX 970 work with demanding 4K games translated perfectly to the new card. PUBG can be maxed out at 3200x1800 and upscaled to 4K for a silky smooth hot drop onto Murder Island. Many players turn off shadows and manipulate digital vibrance settings to make other players easier to see in order to gain an advantage. It works, but pure resolution is the ultimate advantage. You can see everything. No more wondering if that bush in the distance or the protrusion from the trunk of a tree is a player, you can make the distinction instantly, even while on the move. Old games become new again. 4K resolution reveals how forward thinking the visual design of Valve titles Half-Life 2, Portal 2, and Team Fortress 2 were. Adjusting DPI scaling in Windows is rather straightforward. Right-clicking the desktop and selecting the Display settings option takes you to a pane labeled Scale and layout. From here, you have a pulldown menu of scaling options in 25% increments or the option to input a custom value, which the operating system warns will likely be a bad idea. As badly as the recommended scaling values work, I assume a gun pops out of your optical drive bay and shoots you if you try custom values. Generally the 200% scaling option works well with the 3840x2160 resolution and it simply doubles up the pixels, making your display effectively the same as a 1080p monitor. Users electing to go 4K on a 24-inch or or 27-inch panel may find that the 200% scaling option works well because the screens are much smaller and the increased pixel density of a 4K panel produces a superior image to a native 1080p screen at those sizes. 4K users on 32-inch and larger panels will want to chose a lower value to take advantage of the extra real estate afforded by the 8 million+ pixels offered at 4K. On my 40-inch panel, a 125% scaling setting gives a look similar to that of a 27-inch 1440p screen. Text on the desktop and in browsers remains razor sharp and everything it pretty much the correct size. The problems start cropping up the moment you begin using other applications, though. The Steam UI does not appear to work with Windows scaling at all. The whole thing looks like a pixelated mess and it makes library text and the like harder to parse. The Steam in-game overlay suffers the same issue. Oddly enough, Steam’s Big Picture Mode appears to offer perfect scaling support and is razor sharp and looks perfect at any scaling interval you select. The Blizzard App is useable, but lacks the clarity seen at native 100% or 200% scaling. EA’s Origin client title bar menu only renders at native 100%, though the library and anything inside the window appears to scale properly. Ubisoft’s Uplay app works perfectly with non-native scaling modes. 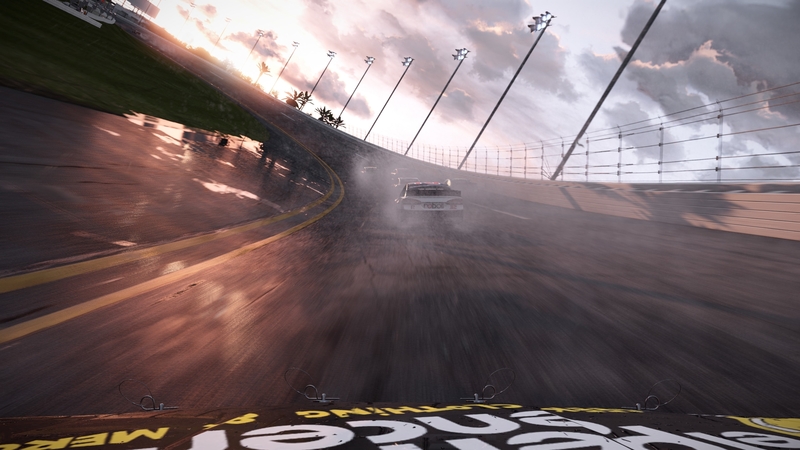 Every rain drop and puddle reflection is crystal clear in Project Cars 2. As unpleasant as the poor scaling issue is with Windows apps, playing games when using any DPI setting other than 100% gives unpredictable results when trying to play games. After I got my DPI scaling the way I wanted it for browsing and work, I ventured back into playing games, only to find that a large number of them were not working properly. The issues ranged from having mouse cursors fail to align with onscreen menus or being put into invisible, inescapable boxes to some games launching into 1080p windows within a full 4K black screen. Once the games started exhibiting this behavior, some could be fixed by hitting Alt+Enter a few times and others became totally unresponsive as if the graphics card driver had failed. A few of them required that I power down my PC manually, bypassing the preferred Windows shutdown since Crtl+Alt+Del would not snap them out of the freeze. At first, I was unable to pinpoint why everything was going wrong. I incorrectly assumed that my GPU driver install had not gone properly or my new display and PC were not fully compatible with each other. Contacting support for a few of the games did not really get me anywhere. After scouring forums from Google results, I saw a pattern developing. Most of the folks having similar issues that were able to reach satisfying conclusions determined that these games simply do not support Windows DPI scaling. Sure enough, selecting 100% scaling, rebooting and trying the game again fixed everything. This was an unacceptable solution that wasted time and was tedious. Thankfully, a workaround exists that solves the issue for 99% of the problem games. Right-clicking the game’s executable and navigating to the compatibility tab offers the option to override DPI scaling behavior of the system. This allows the given game to ignore the Windows scaling issues and run like normal. 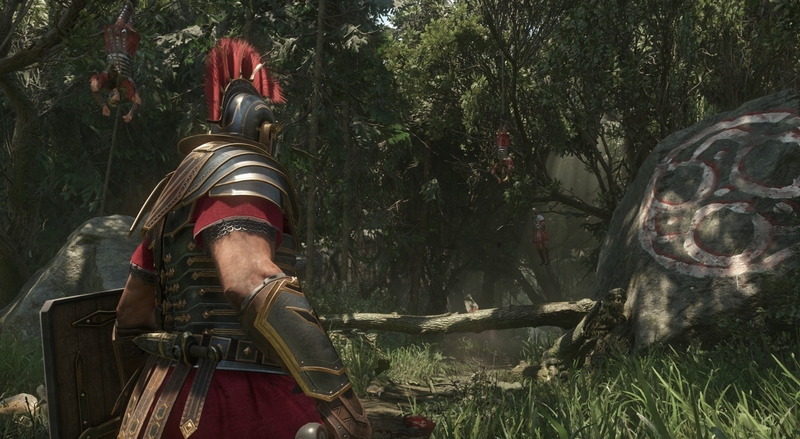 Crytek's maligned Ryse: Son of Rome remains one of the best looking PC games years after release. PC gamers can enjoy the benefits provided by the newest HDR panels provided they have the right hardware and the games support it. An AMD RX 400 or 500 series GPU is required for Team Red users and a GeForce GTX 1000 series GPU is required for Team Green users. The TV or monitor must be HDR10 or Dolby Vision certified. HDR10 and Dolby Vision are competing HDR standards and have different requirements that must be met before a display can be certified. Dolby Vision certification is less common as it has higher standards for compliance. Only LG’s OLED TVs and a few high-end Vizio TVs meet the standard. HDR10 support is a bit more relaxed and open standard. It allows for a wider range of brightness and color space requirements. Generally, a excellent HDR display will offer near full coverage of the DCI P3 color space and a 10 or 12-bit panel with 1000 nits or more of brightness. Most HDR video content is mastered at 4000 nits. As with any piece of technology, manufacturers will fudge numbers or use deceptive marketing to make their products seem superior even if they aren’t in practice. Many budget TVs will advertise themselves as HDR-ready even when they fall far from being able to meet the recommended specs of the HDR formats. The TCL 43S405 I’m using is one such device. While it has a 10-bit panel and is capable of covering ~65% of the color requirements of the HDR10 spec, it can only deliver those colors at a brightness around 250 nits. HDR content still works and is an improvement over SDR, but my particular display is not representative of what you could experience on a fully-compliant high-end OLED TV. To be fair, the TCL costs $6720 less than the Dolby Vision Active HDR-certified LG OLED W.
Shadow Warrior 2 was the first PC game to feature proper HDR10 support. It was soon followed by Obduction, Mass Effect: Andromeda, Resident Evil 7, Hitman, Forza Motorsport 7, Battlefield 1 and a few others. Adoption of the standard is becoming more common, especially as both of the consoles offer HDR10 support in most new releases. In most games, simply toggling the HDR option in a graphics menu is enough to cause your display to flicker into HDR mode. My TCL goes black for a moment and the image reappears with a HDR watermark the briefly appears in the top right hand corner to let you know everything is working. 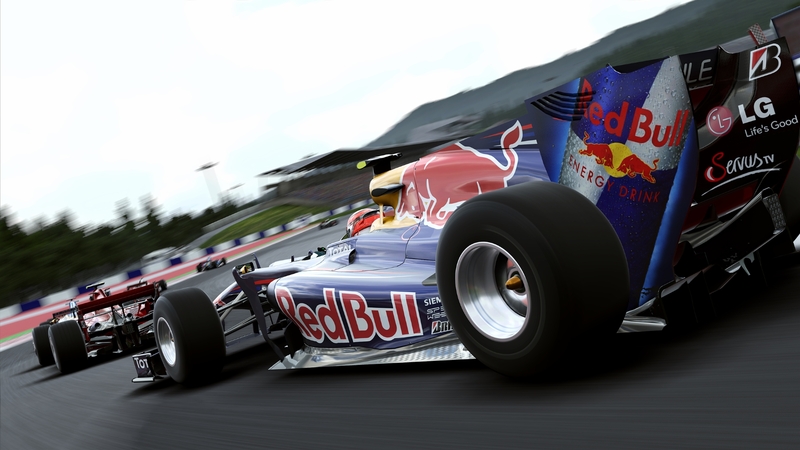 In 4K, F1 2017 looks like a pre-rendered cutscene. 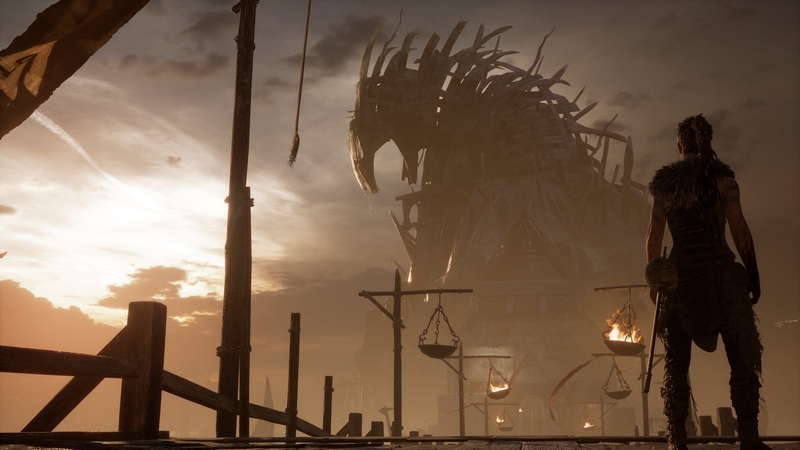 Most HDR games off separate brightness and contrast settings for HDR mode that allow players with out of spec panels (cough) to compensate for the lack of required brightness or color space. Some games will not show HDR options unless the user has the new Windows 10 HDR option enabled. Enabling this system wide mode works about as well as DPI scaling and is effectively broken for nVidia users since the Creator’s Update. Thankfully, if you start your HDR game after enabling the mode, the output is generally correct. When you get it working, HDR is very impressive. Extra details in shadowy areas becomes easier to pick out and bright daylight scenes feel more lifelike due to the enhanced contrast. The best implementation I’ve experienced so far has been with Resident Evil 7. It is a dark game to begin with, so the improved contrast alone is a big improvement. When light sources are pointed towards the player for dramatic effect, the overbearing brightness really adds to the immersion. In Forza Motorsport 7, seeing your driver outside the car under an overhang during the midday sun provides some of the most realistic looking lighting I’ve ever seen in a game. Colors that are subdued on the driver’s suit in the shade are bursting with vibrance on the opposite side that is drenched in sunlight. Ultrawide monitors are the belle of the PC gaming ball in 2017. They are incredibly pricey, but offer increased screen size and immersion compared to their 27-inch counterparts. Anyone considering going 4K should know that a poor man’s version of 21:9 is possible when using a larger display. Using the Custom Resolution Utility mentioned earlier, PC gamers can create a 3840x1620 resolution, which uses a 21:9 aspect ratio. This “fake” 21:9 works really well with a large VA panel capable of deep, inky blacks. The bars on top and bottom of the display are unnoticeable while playing and the large size of the screen keeps the edges of the games in your peripherals when using the proper 21:9 FoV. The increased resolution over typical 3440x1440p monitors is an added bonus and users still get the increased performance from running a resolution below native 4K. 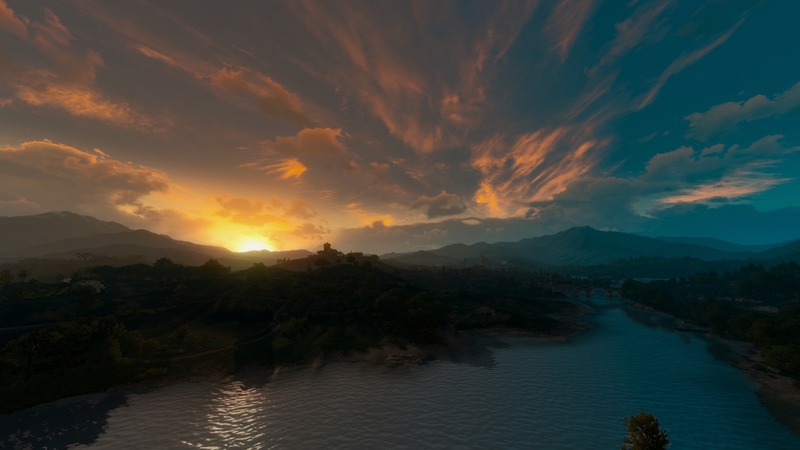 This 4K nVidia Ansel landscape shot of The Witcher 3 looks okay, I guess. Would I do it all over again? Absolutely. Working through the DPI issues was a struggle I would rather not have had to deal with, but I got past it and everything works the way I want it. In a perfect world, Microsoft would find a way to offer a scaling solution as elegant as Apple provides on OSX. More and more users are going to be upgrading to higher resolution displays in the future and the problem will only get worse. HDR is exciting. It will eventually take over and looking back on games and content in SDR will elicit the same reaction we give to standard definition TV content now that HDTV rules the world. As soon as any company offers a fully-compliant HDR panel near the 40-inch size, I will immediately upgrade (there are no true HDR panels under 55 inches currently). Gaming monitor manufacturers promised that Freesync 2 and G-Sync 2 displays would be on shelves soon, but no concrete dates have been given and no indication has been made if these will be true 1000+nit panels or just “HDR-ready” like many HDTVs. The brand new Samsung C32HG70 offers AMD Freesync 2 and ~600 nits of brightness with its 1440p high-refresh panel and is the only real option in the PC gaming monitor space for HDR. We are in exciting times in PC gaming and hardware and I can’t wait to see what’s next. I apologize to anyone who willingly read this novel to the end. Chris Jarrard posted a new article, So You Think You Want to Go 4K? Man that's tempting to get a screen like that so cheap, but when I eventually build a new PC I think I've gotta go variable sync. G-sync, freesync. The variable refresh rate stuff that lets your monitor show smooth motion without tearing or lag at (almost) any frame rate. Nice article! How far away from your screen do you sit? With my current setup a 43" would be far too large and I would have a lot of head movement going from corner to corner without pulling my desk far from the wall. That said my 22" 1680x1050 monitor is pretty long in the tooth and is overdue for an update. I've just been waiting for the 4k and HDR configurations to stabilize. This is tempting though. My head is between 2 and 2-1/2 feet from the screen. Some game required an FoV adjustment away from the standard 90 degree horizontal for 16x9. On the desktop, I just pretend my different windows are monitors without bezels and everything works pretty well. The 43" I'm using is about 3" wider than the 34" ultrawide panels. The panel is flush mounted to the well, floating slightly above the desktop. Not having a monitor stand in the way of all my crap is the best. I will never use another display without a VESA mount. Man that's crazy at that distance I'd get nauseous and throw up pretty quick. Yeah, great article, and EnhancedInterrogator's link to the digitalfoundry clip is eye-opening as well. I've deliberately avoided looking at 4k tv/monitors, due to framerate concerns, but it's evident that upscaling and other tricks make this very viable now. Instead I got a $600 CHG70 (1440p, & 'hdr' – reviews are critical of it's HDR perf --), and am enjoying it, but even 32" seems a little small now. Tell me more about that screen. Is the Windows system-wide HDR broken for you? Yes, it has to be turned off. From what I've read the Win10 Fall Update should address this. In any case I haven't tried HDR games. I do have ME Andromeda, but Lim's review https://www.youtube.com/watch?v=h7JPDa3xgZg did try it on this monitor and was highly critical of the low intrinsic brightness & paltry number of HDR dimming zones, though it looked better hooked up to a PS4. But I saw it for $600 and impulse-bought, thinking that I already was familiar with and liked VA panels, and really just wanted high-refresh rate and less ghosting, both of which are dramatically improved over my older S32D850T. Webpage scrolling is much better of course, and e.g., Doom4 is very playable at the highest difficulty now vs before because of it. So I'm generally pleased, but yeah if there was a 43" 4k HDR tv with DP1.4 and 120hz I'd go for it, now knowing display scaling could address framerate issues. Oh and for desktop use, I'd like a curved display, as this Samsung has: I've decided I like it. Some games turn it on via toggle and a few require the Windows HDR mode to be enabled first. I suggest trying the new Forza Motorsport 7 demo. It has HDR support (but requires windows HDR mode on for it to appear in game as an option). BF1 just got it patched in as well. i didn't know anything really about monitors and resolutions... now i feel like a damn genius. great read, thanks for writing it. To be clear, the DPI scaling issues are 100% on the application developers to support. Dang, pinning this for later. What a fantastic and seriously useful article. Fake HDR is common. The company I work for sells or will sell nearly a dozen models of "HDR" expanded gamut LCD panels, but only two models certified HDR10. It's sleazy marketing and I don't like it but they don't listen to me on that regard. FWIW, I do push really hard for repairable and user-upgradeable notebooks. A lot of engineers and finance people are behind those initiatives too. We're doing it for Shacknews, folks. Usually, TV and monitor scalers do a better job than what nVIDIA and AMD offer (against what's adviced in the article) since the GPU scaler is a multi purpose jack of all trades, while the manufacturer tailors the scaler for the screen, you can make an easy test using a custom resolution and changing between the GPU and Display scaler: the GPU always looks blurrier. For the Display scaler, just make sure to use Aspect Ratio in the GPU control panel. As for a better scaling method, there's an online proposal for integer-ratio scaling ( http://tanalin.com/en/articles/lossless-scaling/ ), something that's been requested for years. just a small correction: GPUs use bilinear interpolation, not nearest neighbor.